Finished with a reflective black veneer, each Ozeri ceramic knife weighs less than half of an equivalent metal knife, thereby reducing fatigue and pain associating with preparing big meals and repetitive cutting. Your satisfaction is 100% guaranteed. This item is covered by Ozeri Distributors LLC Return Policy. Pros: Sharp, easy to clean and they come in a beautiful box ready for gifting. Other Thoughts: I plan on purchasing these knives again for friends and family who love professional cutlery. Pros: The knife set looks beautiful. The black ceramic makes it look like metal. The handle is comfortable. Cons: The knives aren't anywhere near as big as I thought they would be. They also have a particular curve to them that I have not quite mastered yet. The blade didn't cut through an orange on the first try. Had to saw it in order for the blade to penetrate the flesh of the fruit. I generally do not leave feedback for products,but since this product has very little feedback I felt like I should help others out in their decision. The knives arrived way quicker than promised, which was a great surprise to me and also speaks well of the company. They come packaged really well, and each knife was secured in a protected hard foam. When opening the box the first thing you notice is how light these knives are, which helps a lot with hand fatigue. The knives seem well crafted, and the ones I received came without any defects. They were pretty sharp out of the box. I sharpened more for what I do, and they just needed a quick buffing for a very sharp edge. So far mine have kept their edges nicely. One of the biggest bonuses to these knives are the grove they have for the finger closest to the blade. Unlike other knives I have used with a protective grove, these were indented deep enough and have a rounded tip on them so that it is almost impossible for your finger to slip out towards the blade. 5. Longevity ? I have not had these knives long enough to give an opinion on this, all though I will update my feedback accordingly. 6.These were worth way more than the price I paid. They have held up just as good as my more expensive blades. 7. In the end I have zero worry of my wife using these blades, and it will also make her life easier. Cons: These refuse to cook and clean for me. Other Thoughts: If you are looking for a great set of knives that are priced way below what they are truly worth, than these knives are for you. I will update this feedback after a month of use, and then periodically afterwards. Pros: Beautiful design. Cuts like a champ. Excellent addition to our cutlery. Cons: Ceramic knives come with special handling, but it is something you do with a good utility. Pros: Very sharp. Very well made. Great looking and easy to handle. 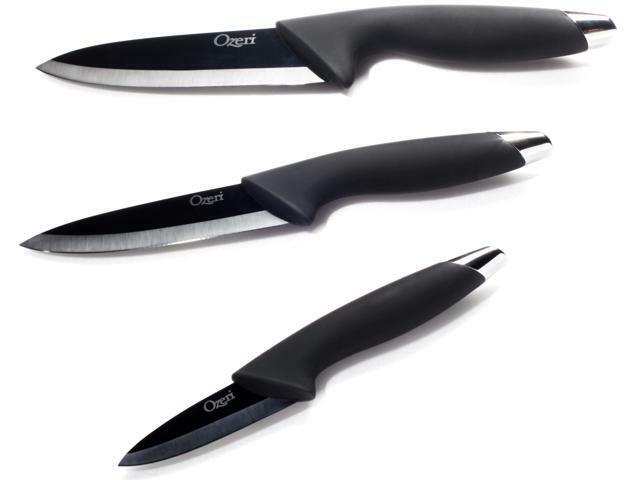 These knives cut quickly and cleanly and are very light in the hand. Other Thoughts: These knives do not replace your steel knives, they augment them. Nothing better for cutting vegetables, fruits and boneless meat but can be snapped if bent too much. Pros: These knives are sharp and cut easily through any fruit/vegetable...watch your fingers. They are easy to clean and don't need to be sharpened. Cons: They are ceramic, so you have to be more careful than with a regular knife. Other Thoughts: I have had these since March, and use them every day to cut all my fruits/veggies/meats etc. They hold up well and I would highly recommend them. They are ceramic, so you have to use more caution than you would stainless steel knives. I would highly recommend this product.